Should children use any particular toothpaste? We recommend that children use toothpaste with fluoride and the American Dental Association Seal of Acceptance. Children under the age of 2 years old should use only a smear of fluoridated toothpaste. 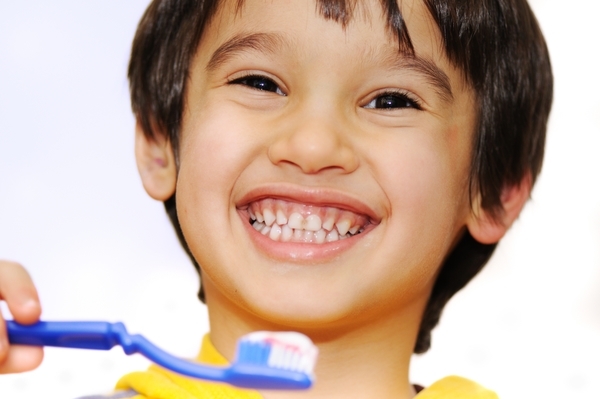 Children ages 2-5 years of age should use a pea-sized amount of fluorided toothpaste. Young children, especially pre-school aged, should not swallow any toothpaste. Parents should dispense the toothpaste and supervise brushing so that the children only use the recommended amount on the brush, as they can easily swallow four times the recommended daily amount of fluoride. We also recommend that parents should brush and floss their child’s teeth twice each day (after breakfast and before bedtime) until the child reaches the age of seven years old. Before this time, children struggle to brush every area of the mouth effectively.